Accusing Congress of speaking the language of Pakistan, PM Modi said, "Congress says Article 370 will not be removed from Jammu and Kashmir. Pakistan is also saying what Congress is saying." 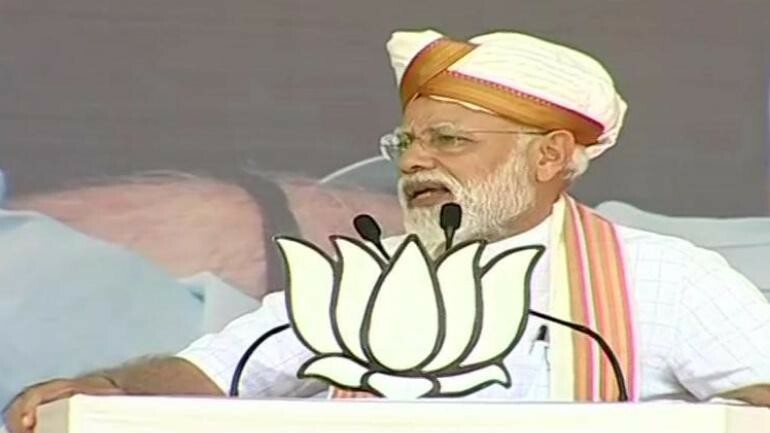 With barely two days remaining for the Lok Sabha 2019 elections, Prime Minister Narendra Modi launched his election campaign in Maharashtra's Latur on Tuesday, April 9. Continuing his attack on the Congress' election manifesto, PM Modi said their manifesto stood for Pakistan more than for India on the issue of Jammu and Kashmir and terrorism. Accusing Congress of speaking the language of Pakistan, PM Modi said, "Congress says Article 370 will not be removed from Jammu and Kashmir. Pakistan is also saying what Congress is saying." The Prime Minister said Congress is a party that wants to give open licence to anti-nationals because the party and their friends think alike. "Congress is responsible for Pakistan coming into existence," Modi said, as he stepped up attack against the grand old party. "Had Congress leaders acted wisely during the pre-independence era, this Pakistan would not have born," Modi stated. PM Modi said those who talk of a separate PM and secession of Jammu and Kashmir are the ones whom the nation had trusted once. "Their real thoughts are now in the open," Modi further stated. Earlier, former Jammu and Kashmir chief minister and National Conference leader Omar Abdullah had said his party will strive hard for restoring the autonomy of Jammu and Kashmir that could include having a 'Sadar-e-Riyasat' (President) and 'Wazir-e-Azam' (Prime Minister). "Both Congress and Pakistan want that our soldiers don't get the strength that they need to tackle the menace of terror," Narendra Modi said in Maharashtra's Latur. On the other hand, Modi said under the BJP's watch it was the policy of 'New India' that it will kill terrorists barging into their dens. The prime minister reiterated his allegation that the opposition parties that they were questioning the valour of the security forces post last month's Pulwama terror attack. Addressing the crowd in Latur, Modi hailed the BJP manifesto and said the party was committed to national security and farmers' welfare among others. "Your trust is my biggest accomplishment in last five years," Modi told Maharashtra. Maharashtra will to the polls in four of the seven phases of the Lok Sabha 2019 elections that begin on April 11 and ends on May 19. Latur, where PM Modi addressed a public rally today will vote on April 18 in the second phase of the general election. The counting of votes will take place on May 23. After Maharashtra's rally PM Modi will land in Karnataka's Chitradurga. After Chitradurga, it will be Mysuru, which was won by the BJP in the 2014 Lok Sabha election. Later in the evening, Modi will reach Tamil Nadu where he will take the BJP rally forward to Coimbatore.